Happy 447th Manila Day! 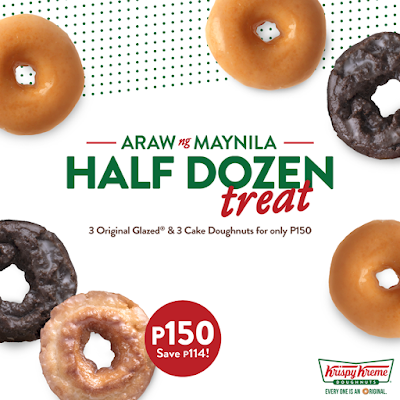 Celebrate this sweet moment with Krispy Kreme's Araw ng Maynila Promo. Buy a box of 3 Original Glazed ® and 3 Cake Doughnuts for only P150 from June 22-25, 2018. Valid in Krispy Kreme Robinsons Place Manila, UST, Lucky China town, Harbour Square, SM Manila and SM San Lazaro only. Valid for dine-in, take-out, and drive-thru only. Not For delivery. Promo cannot be in conjunction with any other promos or discount. Promo is limited to 4 sets per transaction (2 Dozens). Pre assorted na ayaw papili ng 3 cake donut:( sm sanlzaro sungit pa, tindera!! !